From 2010/11 to 2013/14, there were 12.1 day surgeries for dental caries per 1,000 children aged 1 to 4 years old. 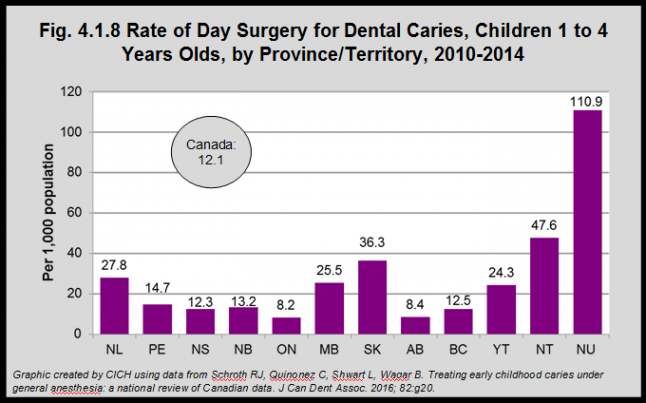 Across Canada, the rate of day surgery for dental caries ranged considerably, 8.2 per 1,000 population (Ontario) to 110.9 per 1,000 (Nunavut). Schroth RJ, Quinonez C, Shwart L, Wagar B. Treating early childhood caries under general anesthesia: a national review of Canadian data. J Can Dent Assoc. 2016; 82:g20.